NAI Horizon’s Top Producers of 2017 are (left to right) Lane Neville, Shelby Tworek, Denise Nunez, Russ Warner, Rick Foss, Barbara Lloyd, Chris Gerow, Mark Wilcke, Isy Sonabend, and Tyler Smith. PHOENIX, ARIZONA (March 5, 2018) – NAI Horizon celebrated its 25th anniversary in 2017. It also celebrated its best year since the end of the Great Recession, buoyed by a diverse group of brokers whose transactions totaled more than $320 million. The broad range of specialties represented in NAI Horizon’s Top Producers of 2017 is a testament to the collective success of professionals from industrial, retail, office, and investment sales. A healthy commercial real estate market allowed these agents to secure the best possible outcomes for their clients. 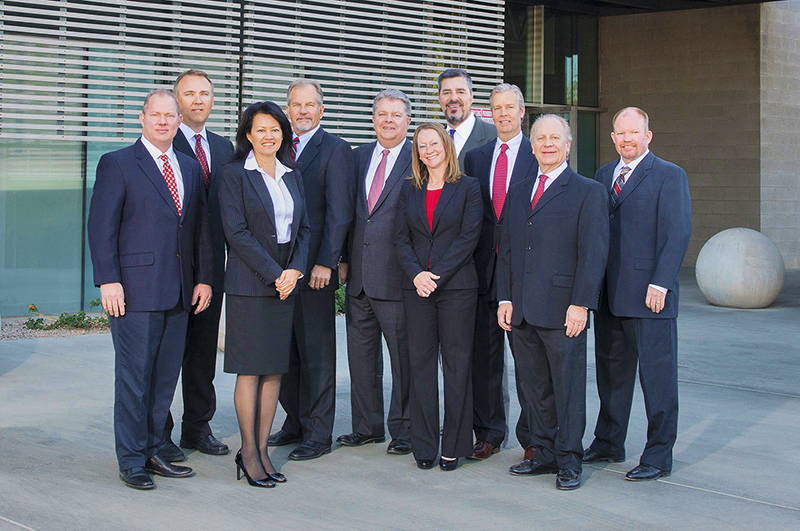 NAI Horizon expanded its presence in the Valley with the addition of six agents. This included the hiring of industry veteran Don Morrow, who joined NAI Horizon as a Senior Vice President to bolster its investment sales division. NAI Horizon’s broker ownership platform allows agents an opportunity to play a direct role in the company’s future. This creates a culture in which its agents can maximize their own business while benefiting from the resources of a global commercial real estate brokerage firm. Russ and Andrew Warner of NAI Horizon’s Manufactured Housing Group negotiated the $34 million sale of the largest recreational vehicle park in Apache Junction, Arizona, fetching $46,575 per space. NAI Horizon’s retail team of Senior Vice Presidents Chris Gerow, Shelby Tworek, Gabe Ortega and Associate Patrick Anthon negotiated long-term leases totaling more than $15 million for Planet Fitness locations throughout the Valley. This retail team also negotiated the $3.1 million sale of a building in Phoenix that will serve as the new offices, adoption center, and no-kill shelter for the Phoenix Animal Care Coalition (PACC911). The NAI Puget Sound Properties and NAI Horizon Investment Sales teams of Senior Vice Presidents Lane Neville and Barbara Lloyd represented the buyer in the $9.675 million acquisition of two retail buildings at Litchfield Marketplace. The NAI Horizon investment sales team of Neville and Lloyd represented the seller in the $7.1 million disposition of Hamstra Square in Chandler, Arizona. Senior Vice President John Filli, SIOR, represented the seller, a debtor in a Chapter 11 proceeding, in a pair of Southeast Valley industrial deals totaling $4.897 million. NAI Horizon Senior Vice Presidents Troy Giammarco and Tyler Smith negotiated a long-term lease worth $3.125 million, bringing Sage Academy to Corporate Center, 10220 N. 25th Ave.